Alicia Rades is a USA Today bestselling author of young adult paranormal fiction with a love for supernatural stories set in the modern world. When she’s not plotting out fiction novels, you can find her writing content for various websites or plowing her way through her never-ending reading list. Alicia holds a bachelor's degree in communications with an emphasis on professional writing. 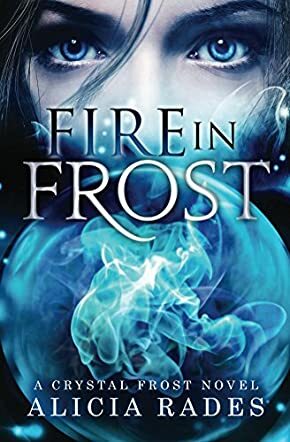 Alicia Rades’ Fire in Frost, Crystal Frost Book 1, sparkles with magical intrigue that pulls the reader in fast and doesn’t let go until the last page. Teenager Crystal’s journey into womanhood comes on a wave of psychic ability that has her questioning her sanity and life. Especially when she comes in contact with Olivia’s ghost: a girl from her class who died last year. But when Crystal’s mother assures her she’s not crazy, she struggles with more questions than answers. Keeping her seer/medium ability a secret from her friends proves a difficult task as she tests, accepts, and grows into her new gift. She soon finds that she’s not the only one keeping secrets. Olivia’s best friend reaches out to Crystal for help with someone she suspects is being physically and mentally abused. Crystal’s abilities are put to the ultimate test to maintain friendships and potentially save a life. Alicia Rades masterfully spins enchanted story threads and pulls them tight around your heart with the satisfying but open ended conclusion of Fire in Frost. Along the way, Crystal experiences powerful internal/external tension through her mystical insight and her relationship excavations. A full cast of ‘true to life’ characters breathe from the pages, carrying you on their journey, imploring you to turn the pages through intrigue, fear, self-doubt, discovery, wonderment, shock, sought after trust and acceptance. Alicia Rades has captured this reader’s interest with a capital I. Can’t wait to dig into another captivating book from Rades in this brilliant Crystal Frost series.